I just love combining colors. 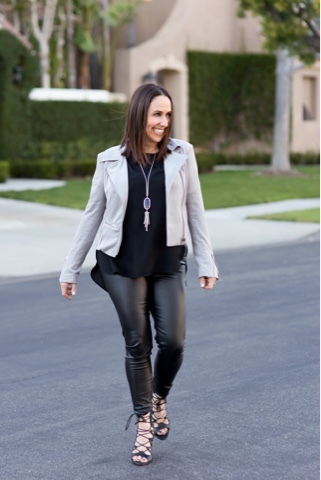 One of my favorite ways to put an outfit together is to pair a monochromatic top and pants or skirt, and add a jacket or blazer in a different color to give it that pop. I wore this outfit to my VICI Sip and Shop party and wanted to incorporate this pop of gray into an all black outfit. 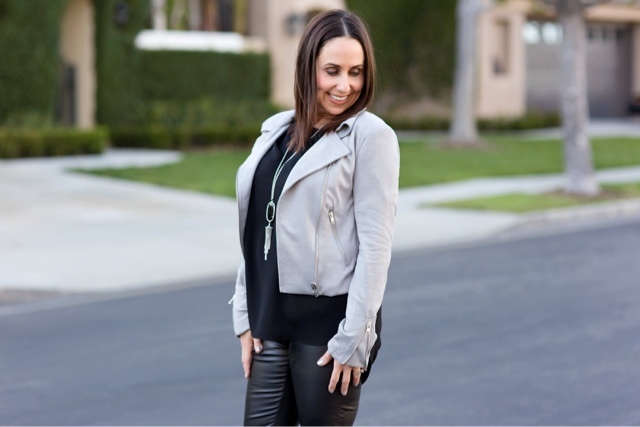 I decided to pair this adorable suede moto jacket (I'm obsessed), with a basic black top and some great faux leather leggings (all from VICI). I then added my favorite Kendra Scott necklace and these to die for Joie lace up heels (that I picked up for the best deal at the Nordstrom half yearly sale) and I was ready to go host my girls night out party!!! Cocktails, treats, girlfriends and shopping ? I could not have asked for a better evening. How do you add a pop of color to your outfits? Let me know. Thanks to Gabi Wells for photos and happy reading!!!! !